Zhengzhang Shangfang published his ideas in a series of articles in Chinese provincial journals, and were not widely disseminated. Some of his notes were translated into English by Laurent Sagart in 2000. Zhengzhang's *w medial could occur only after velar and uvular initials, matching the labio-velar and labio-laryngeal initials of other reconstructions. Instead of marking type B syllables with a *-j- medial, he treated type A syllables as having long xowels. Sagart (1999) used Baxter's system, with minor variations, in a study of the derivational morphology of Old Chinese. Thereafter Baxter and Sagart collaborated on a revision of the reconstruction using additional evidence, including word relationships deduced from these theories of morphology, Jerry Norman's reconstruction of Proto-Min, early loans to other languages, and character forms in recently unearthed documents. They also sought to apply the hypothetico-deductive method to linguistic reconstruction: instead of insisting on deducing patterns from data, they proposed hypotheses to be tested against data. The initial consonants of the revised system largely correspond to those of Baxter (1992) apart from the dropping of the rare initials *z, *j and *hj. Instead of marking type B syllables with a *-j- medial, they treated type A syllables as having pharyngealized initials, adapting a proposal of Jerry Norman, and thus doubled the number of initials. [lower-alpha 5] They also adopted the proposal of Pan Wuyun to recast the laryngeal initials as uvular stops, though they retained a separate glottal stop. -j- in syllables with division-III (or Type B) finals. Karlgren projected both of these medials back to Old Chinese. However, since the work of Yakhontov most reconstructions have omitted a *w medial but included labiovelar and labiolaryngeal initials. Most reconstructions since Pulleyblank have included a medial *r, but the *j medial has become more controversial. On the basis of these combinations, the initials of Old and Middle Chinese can be divided into two broad types: grave initials (labials, velars and laryngeals), which combine with all types of finals, and acute initials (dentals and sibilants), with more restricted distribution. 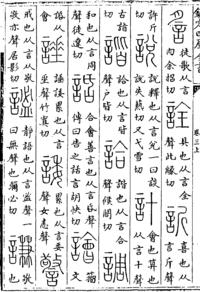 Karlgren derived the four divisions of Middle Chinese finals from the palatal medial and a range of Old Chinese vowels. More recent reconstructions derive division II from an Old Chinese medial *r (given as *l in the early work of Yakhontov and Pulleyblank). This segment also accounts for phonetic series contacts between stops and l-, retroflex initials and (in some later work) the chongniu distinction. Division III finals are generally held to represent a palatal element, at least in Middle Chinese. Division I and IV finals have identical distributions in the rhyme dictionaries. These two classes are believed to be primary, while the others were modified by medials. A fundamental distinction within Middle Chinese is between division-III finals and the rest. Most scholars believe that division-III finals were characterized by a palatal medial -j- in Middle Chinese. Karlgren projected this medial back to a medial *-j- in Old Chinese (*-i̯- in Karlgren's notation), a position followed by most reconstructions up to the 1990s, including those of Li and Baxter. Other authors have suggested that the Middle Chinese medial was a secondary development not present in Old Chinese. Evidence includes the use of syllables with division-III finals to transcribe foreign words lacking any such medial, the lack of the medial in Tibeto-Burman cognates and modern Min reflexes, and the fact that it is ignored in phonetic series. However, it is generally agreed that syllables with division-III finals and other syllables, labelled types B and A respectively by Pulleyblank, were distinguished in Old Chinese, though scholars differ on how this distinction was realized. Most workers assume that words that rhymed in the Shijing had the same main vowel and the same final consonant, though they differ on the particular vowels reconstructed. The 31 traditional Old Chinese rhyme groups could thus be accounted for with four vowels, which Li Fang-Kuei reconstructed as *i, *u, *ə and *a. However some of the rhyme groups reconstructed with *ə or *a gave rise to more than one Middle Chinese rhyme group. To represent these distinctions, he also included three diphthongs *iə, *ia and *ua. In the early 1970s, Nicholas Bodman proposed a six-vowel system for an earlier stage of Chinese. Applying Bodman's suggestion to Old Chinese, Zhengzhang Shangfang, Sergei Starostin and William Baxter argued that the 31 traditional rhyme groups should be split into more than 50 groups. Baxter supported this thesis with a statistical analysis of the rhymes of the Shijing, though there were too few rhymes with codas *-p, *-m and *-kʷ to produce statistically significant results. a pure division III or chongniu-4 final, arising from a type B syllable without an *-r- medial. In syllables with acute initials, the two types of type B final are not distinguished, and the presence or absence of the former *-r- medial is reflected by the initial. Finals with stop codas (traditionally classified as the entering tone) generally parallel those with nasal codas, with the addition of three groups with Middle Chinese reflexes in -k. Recent reconstructions assign these an Old Chinese coda *-wk corresponding to the labiovelar initial *kʷ-. Some words in the Shijing 質 zhì and 物 wù rhyme groups have Middle Chinese reflexes in the departing tone, but otherwise parallel to those with dental finals. Li followed Karlgren in reconstructing such words with an Old Chinese coda *-d. The suffix *-h in Li's notation is intended to represent the Old Chinese precursor to the Middle Chinese departing tone, without specifying how it was realized. The Shijing 祭 jì group has Middle Chinese reflexes in the departing tone only, including some finals that occur only in the departing tone (marked below with the suffix -H). As the reflexes of this group parallel the Shijing 月 yuè group, Li reconstructed these also as *-dh. Following a suggestion of André-Georges Haudricourt, most recent reconstructions derive derive the Middle Chinese departing tone from an Old Chinese suffix *-s. The coda *-ts is believed to have reduced to -j in Middle Chinese. Finals with vocalic codas generally parallel those with dental or velar codas. Because the gē 歌 rhyme group has Middle Chinese reflexes with no -j coda, Li reconstructed it with an Old Chinese coda *-r. However, many words in this group do have a -j coda in the colloquial layers of Min and Hakka varieties, in early loans into neighbouring languages, and in cognates in other Sino-Tibetan languages. 1 2 3 4 5 6 7 8 9 followed by a long vowel, causing palatalization. 1 2 3 4 -o- after velar initials, -wo- after labial initials, -e- after acute initials. 1 2 The final -jæ occurs only after plain sibilant and palatal initials, with no known conditioning factor. 1 2 Baxter (1992), p. 12. 1 2 Handel (2003), p. 548. 1 2 Li (1974–75), p. 244. 1 2 Yakhontov (1978–79), p. 37. 1 2 3 Pulleyblank (1962a), p. 141. 1 2 Baxter (1992), pp. 209–210. 1 2 Li (1974–75), p. 237. 1 2 Li (1974–75), pp. 243–247. ↑ Norman (1988), p. 48. 1 2 Li (1974–75), pp. 248–250. 1 2 Bodman (1980), p. 47. 1 2 Baxter (1992), p. 180. 1 2 Zhengzhang (2000), pp. 42–43. 1 2 Starostin (1989), pp. 343–429. ↑ Zhengzhang (2000), pp. 48–53. ↑ Baxter & Sagart (2014), pp. 3–4, 30–37. ↑ Baxter & Sagart (2014), pp. 4–6. 1 2 Baxter & Sagart (2014), pp. 43, 68–76. ↑ Baxter (1992), pp. 59–60. ↑ Baxter (1992), pp. 258–267, 280–282. ↑ Norman (1994), p. 400. ↑ Pulleyblank (1992), p. 379. 1 2 3 Baxter (1992), pp. 370–371, 373. ↑ Norman (1994), pp. 403–405. ↑ Zhengzhang (2000), p. 58. ↑ Baxter & Sagart (2014), pp. 43, 274, 277. ↑ Zhengzhang (2000), p. 40. 1 2 3 4 Zhengzhang (2000), pp. 40–43. ↑ Baxter (1992), pp. 548–555. ↑ Baxter (1992), pp. 537–543. ↑ Baxter (1992), pp. 422–425. ↑ Baxter (1992), pp. 425–434. ↑ Baxter (1992), pp. 370–389. ↑ Baxter (1992), pp. 476–478. ↑ Baxter (1992), pp. 497–500. ↑ Baxter (1992), pp. 489–491. ↑ Baxter (1992), pp. 505–507. ↑ Baxter (1992), pp. 524–525. ↑ Baxter (1992), pp. 301–302. ↑ Baxter (1992), pp. 555–560. ↑ Baxter (1992), pp. 543–548. ↑ Baxter (1992), pp. 434–437. ↑ Baxter (1992), pp. 437–446. 1 2 Baxter (1992), pp. 389–413. ↑ Baxter (1992), pp. 472–476. ↑ Baxter (1992), pp. 494–497. ↑ Baxter (1992), pp. 484–488. ↑ Baxter (1992), pp. 503–505. ↑ Baxter (1992), pp. 518–524. ↑ Baxter (1992), pp. 532–536. ↑ Baxter (1992), pp. 325–336. ↑ Baxter (1992), pp. 308–319. ↑ Baxter (1992), pp. 436–437. ↑ Baxter (1992), pp. 438–446. ↑ Baxter (1992), pp. 292–298. ↑ Baxter (1992), pp. 446–452. ↑ Baxter (1992), pp. 452–456. ↑ Baxter (1992), pp. 413–422. ↑ Baxter (1992), pp. 414, 479–481. ↑ Baxter (1992), pp. 464–472. ↑ Baxter (1992), pp. 491–494. ↑ Baxter (1992), pp. 478–483. ↑ Baxter (1992), pp. 500–503. ↑ Baxter (1992), pp. 507–518. ↑ Baxter (1992), pp. 526–532. ↑ Li (1974–75), pp. 250–251, 265–266. ↑ Baxter (1992), pp. 294, 297. Branner, David Prager (2006), "What are rime tables and what do they mean? ", in Branner, David Prager, The Chinese Rime Tables: Linguistic Philosophy and Historical-Comparative Phonology, Amsterdam: John Benjamins, pp. 1–34, ISBN 978-90-272-4785-8. —— (2011), "Phonology in the Chinese Script and its Relationship to Early Chinese Literacy", in Li, Feng; Branner, David Prager, Writing and Literacy in Early China (PDF), Seattle: University of Washington Press, pp. 85–137, ISBN 978-0-295-99337-9. —— (1993), "A Handbook of Old Chinese Phonology by William H. Baxter", Book Reviews, The Journal of Asian Studies, 52 (3): 704–705, doi:10.2307/2058873, JSTOR 2058873. —— (1973), "Some new hypotheses concerning word families in Chinese", Journal of Chinese Linguistics, 1 (1): 111–125. —— (2007), "Reconstructing Old Chinese uvulars in the Baxter-Sagart system" (PDF), 40th International Conference on Sino-Tibetan Languages and Linguistics. Schuessler, Axel (1987), A Dictionary of Early Zhou Chinese, Honolulu: University of Hawaii Press, ISBN 978-0-8248-1111-2. —— (2007), ABC Etymological Dictionary of Old Chinese, Honolulu: University of Hawaii Press, ISBN 978-0-8248-2975-9. —— (1970), translated by Jerry Norman, "The phonology of Chinese in the first millennium BC (rounded vowels)", Unicorn, 6: 52–75: translation of Yakhontov, S.E. (1960), "Fonetika kitayskogo yazyka I tysyacheletiya do n.e. (labializovannyye glasnyye)", Problemy vostokovedeniya, 6: 102–115. —— (1978–79), translated by Jerry Norman, "Old Chinese Phonology" (PDF), Early China, 5: 37–40: translation of Chapter 2 (Phonetics) of Yakhontov (1965). Behr, Wolfgang (1999), Odds on the Odes, archived from the original on 19 May 2011. Boltz, William (1993), "Notes on the Reconstruction of Old Chinese" (PDF), Oriens Extremus, 36 (2): 186–207, JSTOR 24047376. Coblin, W. South (1995), "William H. Baxter: A Handbook of Old Chinese Phonology", Monumenta Serica, 43: 509–519, doi:10.1080/02549948.1995.11731284, JSTOR 40727078. Norman, Jerry (1993), "A Handbook of Old Chinese Phonology by William H. Baxter", Book Reviews, The Journal of Asian Studies, 52 (3): 704–705, doi:10.2307/2058873, JSTOR 2058873. Peyraube, Alain (1996), "William H. Baxter, A Handbook of Old Chinese Phonology", T'oung Pao (in French), 82 (1/3): 153–158, doi:10.1163/1568532962631094, JSTOR 4528688. Pulleyblank, Edwin G. (1993), "Old Chinese phonology: a review article", Journal of Chinese Linguistics, 21 (2): 337–380, JSTOR 23753918. Baxter, William H. (1994), "Reply to Pulleyblank", Journal of Chinese Linguistics, 22 (2): 139–160, JSTOR 23756589. Pulleyblank, Edwin G. (1994), "Reply to Baxter's reply", Journal of Chinese Linguistics, 22 (2): 161–169, JSTOR 23756590. Beckwith, Christopher I. (2002), "The Roots of Old Chinese. Laurent Sagart", Anthropological Linguistics, 44 (2): 207–215, JSTOR 30028844. Mair, Victor (2004), "Laurent Sagart. The Roots of Old Chinese" (PDF), Sino-Platonic Papers, 145: 17–20. Miyake, Marc (2001), "Laurent Sagart : The Roots of Old Chinese", Cahiers de linguistique – Asie orientale, 30 (2): 257–268, doi:10.1163/19606028-90000092. Rubio, Gonzalo (2001), "The Roots of Old Chinese, by Laurent Sagart", Language, 77 (4): 870, doi:10.1353/lan.2001.0238. Schuessler, Axel (2000), "Book Review: The Roots of Old Chinese" (PDF), Language and Linguistics, 1 (2): 257–257. Ting, Pang-Hsin (2002), "Morphology in Archaic Chinese", Journal of Chinese Linguistics, 30 (1): 194–210, JSTOR 23754869. Sagart, Laurent (2002), "Response to Professor Ting", Journal of Chinese Linguistics, 30 (2): 392–403, JSTOR 23754076. Ting, Pang-Hsin (2002), "Monosyllabic characters in Chinese: a rejoinder to Professor Sagart's reply", Journal of Chinese Linguistics, 30 (2): 404–408, JSTOR 23754077. Starostin, Georgiy (2009), "Axel Schuessler : ABC Etymological Dictionary of Old Chinese" (PDF), Journal of Language Relationship, 1: 155–162. Goldstein, D.M. (2015), "William H. Baxter and Laurent Sagart: Old Chinese: A New Reconstruction", Bulletin of the School of Oriental and African Studies, 78 (02): 413–414, doi:10.1017/S0041977X15000361. Ho, Dah-an (2016), "Such errors could have been avoided – review of Old Chinese: A New Reconstruction", Journal of Chinese Linguistics, 44 (1): 175–230, doi:10.1353/jcl.2016.0004. Schuessler, Axel (2015), "New Old Chinese", Diachronica, 32 (4): 571–598, doi:10.1075/dia.32.4.04sch. Starostin, George (2015), "William H. Baxter, Laurent Sagart. Old Chinese. A New Reconstruction" (PDF), Journal of Language Relationship, 13 (4): 383–389.